The rules of chess (also known as the laws of chess) are rules governing the play of the game of chess. While the exact origins of chess are unclear, modern rules first took form during the Middle Ages. The rules continued to be slightly modified until the early 19th century, when they reached essentially their current form. The rules also varied somewhat from place to place. Today chess's international governing body FIDE (Fédération Internationale des Échecs) sets the standard rules, with slight modifications made by some national organizations for their own purposes. There are variations of the rules for fast chess, correspondence chess, online chess, and chess variants. Chess is a game played by two people on a chessboard, with sixteen pieces (of six types) for each player. Each type of piece moves in a distinct way. The goal of the game is to checkmate, that is, to threaten the opponent's king with inevitable capture. Games do not necessarily end with checkmate – players often resign if they believe they will lose. In addition, there are several ways that a game can end in a draw. Besides the basic movement of the pieces, rules also govern the equipment used, the time control, the conduct and ethics of players, accommodations for physically challenged players, the recording of moves using chess notation, as well as provide procedures for resolving irregularities which can occur during a game. The rooks are placed on the outside corners, right and left edge. The knights are placed immediately inside of the rooks. The bishops are placed immediately inside of the knights.The queen is placed on the central square of the same color of that of the player: white queen on the white square and black queen on the black square. The king takes the vacant spot next to the queen.The pawns are placed one square in front of all of the other pieces. The player controlling the white pieces is named "White"; the player controlling the black pieces is named "Black". White moves first, then players alternate moves. Making a move is required; it is not legal to skip a move, even when having to move is detrimental. Play continues until a king is checkmated, a player resigns, or a draw is declared. In addition, if the game is being played under a time control players who exceed their time limit lose the game. The official chess rules do not include a procedure for determining who plays White. Instead, this decision is left open to tournament-specific rules (e.g. a Swiss system tournament or Round-robin tournament) or, in the case of non-competitive play, mutual agreement, in which case some kind of random choice is often employed. A common method is for one player to conceal a piece (usually a pawn) of each color in either hand; the other player chooses a hand to open and reveal their color. Play then commences with white. The king moves exactly one square horizontally, vertically, or diagonally. A special move with the king known as castling is allowed only once per player, per game. The queen moves any number of vacant squares in a horizontal, vertical, or diagonal direction. A rook moves any number of vacant squares in a horizontal or vertical direction. It also is moved when castling. A bishop moves any number of vacant squares in any diagonal direction. A knight moves to the nearest square not on the same rank, file, or diagonal. (This can be thought of as moving two squares horizontally then one square vertically, or moving one square horizontally then two squares vertically—i.e. in an "L" pattern.) The knight is not blocked by other pieces: it jumps to the new location. Pawns have the most complex rules of movement: A pawn moves straight forward one square, if that square is vacant. If it has not yet moved, a pawn also has the option of moving two squares straight forward, provided both squares are vacant. Pawns cannot move backwards. Pawns are the only pieces that capture differently from how they move. A pawn can capture an enemy piece on either of the two squares diagonally in front of the pawn (but cannot move to those squares if they are vacant). The pawn is also involved in the two special moves en passant and promotion. Pawns can be promoted in any piece when they reach last rank. Each square of the chessboard is identified with a unique pair of a letter and a number. The vertical files are labeled a through h, from White's left (i.e. the queenside) to White's right. Similarly, the horizontal ranks are numbered from 1 to 8, starting from the one nearest White's side of the board. Each square of the board, then, is uniquely identified by its file letter and rank number. The white king, for example, starts the game on square e1. The black knight on b8 can move to a6 or c6. 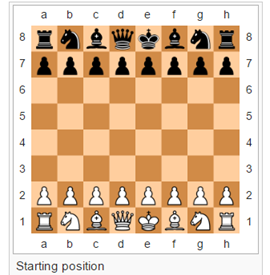 In formal competition, each player is obliged to record each move as it is played in a chess notation in order to settle disputes about illegal positions, overstepping time control, and making claims of draws by the fifty-move rule or repetition of position. 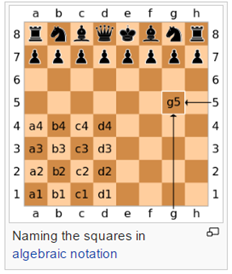 Algebraic chess notation is the accepted standard for recording games today. There are other systems such as ICCF numeric notation for international correspondence chess and the obsolete descriptive chess notation. The current rule is that a move must be made on the board before it is written on paper or recorded with an electronic device. Both players should indicate offers of a draw by writing "=" at that move on their scoresheet. Notations about the time on the clocks can be made. If a player has less than five minutes left to complete all of their moves, they are not required to record the moves (unless a delay of at least thirty seconds per move is being used). The scoresheet must be made available to the arbiter at all times. A player may respond to an opponent's move before writing it down.